Eu teria feito Shenmue III exatamente com a engine do 1 e 2. Teria sido mais nostálgico, mais fácil, mais rápido, e teria mais cara de Shenmue. Claro, seria estranho para essa geração atual ver algo assim sendo lançado hoje em dia, mas creio que quem está ansioso para o jogo é justamente o povo das antigas, e não novos gamers. Difícil. É mais fácil fazer o jogo todo na Unreal com assets originais e seguindo os manuais de modelagem padronizada da era Naomi-Am2 para personagens etc do que lidar com aquela engine. A empresa que portou o 1 e o 2 teve que fazer magia negra, ler diversos manuais traduzidos da Am2 e engenharia reversa para poder entender a porra toda, e dá pra ver claramente que não conseguiram entender tudo. Não é algo acessivel. E tempo é dinheiro, coisa que certamente a Ys.net não tem a perder. Qualquer um aqui pode perder umas horinhas e já brincar na Unreal. Quanto aqui conseguiriam o mesmo resultadosem devkit e acesso a programas proprietarios da SEGA (e mesmo tendo)? Hmnn, achei que não tinha muito segredo em mexer com a antiga engine. Bom, então aí está explicado terem modificado tudo. In the game there will be an arcade where you trade your in-game currency for a separate currency used only for mini games. Playing mini-games will earn you prizes, which in turn can be sold at pawn shops for money. It’s a far more complicated way to earn more money than the previous two games, but it doesn’t sound like too much of a headache. Also revealed is a turtle race mini-game which sounds like it plays a lot like Sonic Adventure‘s Chao race, where you cheer on your turtle. The forklift will return as a part-time job, though no mention yet of racing them. You can check out the full article on Twinfinite where they detail a fishing mini-game and other in-game ways to earn money. What do you think of these new bits of info? Chineses filhas da puta... Fazer o quê? É pelo bem do Shenmue 4. Shenmue creator Yu Suzuki shared new information and screenshots of Shenmue III during the “Beachside Chat with Yu Suzuki” panel at Reboot Develop Blue 2019 in Dubrovnik today. Suzuki believes in the diversity of game puzzles and wants to present various ways to solve the problem. 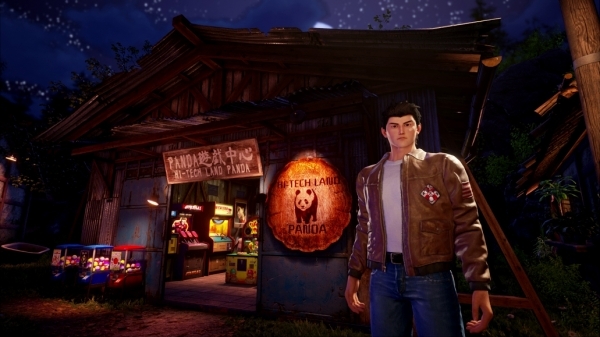 For example, in one of the screenshots showcased, there are familiar Japanese food stalls in a Chinese setting and mountains from a totally different location. It is about creating the feeling of being in a location. He put more work into the faces and animations to give off a “feeling” rather than “reality.” The music, for example, was recorded with real Chinese instruments. And while the boat showcased in one of the screenshots is not something you would actually see in China, it still has the flavor of China. Suzuki shifted the design of the game to meet his team’s strengths (such as his artist who enjoys making boats) as he realized the team needs to be engaged to make a good game. Suzuki is trying to do things in Shenmue III that he could not do in its predecessors, such as pawning an item and gambling the money away. While those systems existed before, they were not connected. The core fighting system is better integrated through a skill book which unlocks skills by collecting more items. The game’s Baidu Village setting is one of two main areas. Baidu Village is a countryside area that features items and prize winning, as well as skills that can be purchased with money or exchanged. Every game system is tied to the skill book. Suzuki is working towards more complex accessibility modes for battle. Rather than difficulty dip switches like back in the day, they let you set the battle difficulty, ranging from easy to “better not play this mode.” The complexity of control increases with your chosen difficulty. The dojo can be used to practice with a wooden man, spar, compete in matches, and increase your skills. Your can level up your dan in the dojo to clear matches that surface during the story. There will be a movie that summarizes Shenmue I and II for newcomers, but Suzuki recommends playing them before playing Shenmue III. Minigames include gatcha, crane games, a punching game, and an overall emphasis on physical or mechanical games. There will be electronic (video) games as well, and you can also win tickets that can be redeemed for prizes and more, which connect to the skill tree. The forklift will return, but its use is still a secret. The forklift in this game will be slower than the original, but it is better integrateed into the game and is connected to critical path-related things. The play style changed from Shenmue I to II, and has changed again with Shenmue III, but Suzuki thinks original fans will really like what the team at Ys Net has done. Shenmue III is due out for PlayStation 4 and PC on August 27. Watch the panel archive below, ripped via the Twitch archive. View the new screenshots at the gallery. Parace baum uai, sempre achei Xenmue um boixta, mas com o orçamento dos cara, e fazendo no fundo do quintal, até que ta ficando ok. Espero que o pessoal nao fique chorando e reclamando depois, igual quando sai um Sonico novo. Exato. Se pessoas como eu idolatram Shenmue, imagina o que esse jogo significa para o Yu Suzuki? Deve ser tipo como se fosse um filho para ele. Sendo assim, duvido muito que ele deixaria sair uma porcaria qualquer, só para dizer que existiu um terceiro Shenmue.